In compliance with the MEPC (Marine Environment Protection Committee) RESOLUTION 115(51) adopted on 1st April 2004, relating to the International Convention for the Prevention of Pollution from Ships (Annex IV MARPOL 73/78). On-land acceptance of a waste water service to prevent pollution from ships with a gross tonnage equal to or greater than 400 GT, which carry up to 15 people or travel internationally. “Waste water” is understood as water coming exclusively from waste pipes from any type of toilet or urinal; also from sink and washbasin waste pipes. The water from waste pipes located in medical facilities (dispensaries, hospitals, etc.) or from waste pipes in areas that transport live animals must be notified prior to unloading. Unloading waste water as a result of a breakdown suffered by the ship or its equipment is not permitted. Under no circumstances may waste water from industrial processes or from cargo be unloaded. Water with solid waste or water that causes colouration in the surrounding water will not be accepted. This waste will be dealt with in accordance with the regulations in force in the recipient territory. Before accepting the waste delivery declaration, the company may review the International Certification for Prevention of Pollution by Waste Water and check that there is a universal connection to land so that it is possible to connect the recipient facilities’ pipe to the ship’s discharge pipe (exterior diameter 210 mm, 4 orifices and 16 mm wide flange). The facilities for receiving waste water are mobile (tanker lorry) and sized according to each delivery request. 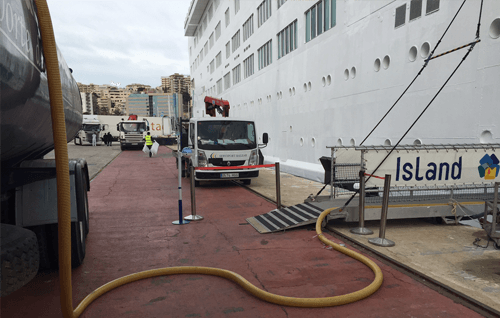 The ship may request a complaint form from the operations manager regarding the service received at the waste water removal reception service. Serviport Balear S.L. Services associated with maritime transport.